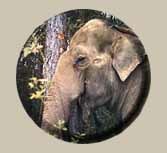 Using the MicroWorlds logo program, I created a fun activity for students that reinforces information they learned about the Sanctuary's Asian Elephants. To play the logo game through your browser, you will need to use the required plug-in and increase the memory of your browser. More information is at the Microworld's web site: www.microworlds.com. For those of you ready to try the game through your browser now, visit the elemazes page. If you are interested in trying the elemazes game but need more help or would like to receive the "What do Elephants Like to Do?" Microworlds Logo game on disk, email Barbara Peskin at bpeskin@aics.net. Back to the Science Page. Last updated by , December 2000.